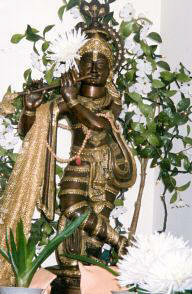 Narada said: “O great Muni! Thou hast treated of Dharma and other things but thou hast not recited the glory of Vaasudeva. For this reason, I think, the Lord is not satisfied. Therefore, O blessed one! write about the various glorious deeds of Lord Krishna, so that all people may obtain the final emancipation by knowing them. This universe is also an aspect of Bhagavan, because its creation, preservation and dissolution proceed from Him. Thou knowest all this thyself. But thou hast shown to others only a portion of this Truth. Therefore, O sage! sing the glory of the Omnipresent Hari, by knowing which even the wise reach the end of their quest. The wise know this alone and no other to be the remedy for the miseries of beings that are repeatedly tossed into Samsara.” Thereupon Sri Vyasa wrote Srimad Bhagavata and attained perfect peace of mind. He taught it to his son, Suka. The Puranas hold a unique place in the history of religious literature of the Hindus. They contain mine of knowledge and information on all philosophical and religious topics. Srutis or Vedas cannot be easily understood by the common people. So the all-merciful Vedavyasa composed the eighteen Puranas for the benefit of mankind and explained in an easy way the subtle truth and the deep problems of the Srutis. They are indeed an encyclopaedia of Hindu religion and ethics. The Puranas contain fables, fairy-tales, philosophy, religion, myth and legend. A Western reader can hardly appreciate the teaching and value of our Puranas unless he is conversant with the methods employed by the Indian Rishis in inculcating the truths of philosophy and religion. The task of the Puranas is to popularise the Vedic truths by means of narratives, stories and anecdotes. Bhagavata is a practical guide for all. It teaches that God-realisation alone can give salvation for man, and shows the ways to attain God-consciousness. It teaches that God alone really exists and that God-realisation is the be-all and end-all of life. It teaches us to realise God everywhere and always and in every situation of life. It is indeed a wonderful book. It is a great treasure for man. Bhagavata is the solace of life. It is unique in its beauty and charm, in its diction and philosophy. It is a valuable treasure-house of divine knowledge. A study of this book inspires devotion, instills knowledge and Vairagya. The glories of Lord Vaasudeva are vividly described in this book. The author of this book is the great Vyasa. He taught this to his son, Suka. There are many commentaries on this book. Sridhara Swami’s commentary is the most famous and authoritative one. The Bhagavata is the most popular and exalted of all Puranas. It is held in the highest esteem by the Vaishnavas in all parts of India. It is a monumental work amongst the devotional works which are the pride and glory of the Sanskrit literature. Vyasa himself says that Srimad Bhagavata is the quintessence of that gigantic work Mahabharata and it is the ripe fruit of the whole Vedic literature. It is the most favourite book with preachers and religious teachers. The book is worshipped in all Hindu houses. It is recited all over India by learned Pundits, Sadhus and Sannyasins. 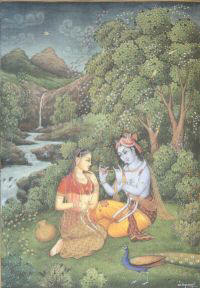 Jnana, Bhakti and Karma are assigned their respective places in this book. Karma is prescribed for those who are very much attached to the body and this world. Jnana is prescribed for those who are detached and dispassionate (Virakta). Bhakti is prescribed for those who are neither very much attached nor very much detached and who are indifferent. It teaches all about Bhagavata Dharma or the religion of love. All that is noble and inspiring in Hindu Religion, philosophy and culture is found in Bhagavata. The highest truths of religion and philosophy and the highest principles of ethics are beautifully explained in this marvellous and unique book. Attractive stories are a means employed by the Hindu Rishis and sages for teaching morality, philosophy and religion. The author of the Bhagavata has taken recourse to this method. The stories and anecdotes goad and lure the mind to the truths of religion. They are like sugar-coated tablets. They serve the purpose of entertaining the people of undeveloped minds. Translation of this great book into a foreign language can never bring the charm and beauty of the original, however erudite, skilful and powerful the translator may be. The Bhagavata consists of eighteen thousand Slokas, three hundred and thirty-two chapters and twelve Skandhas. The book is named Bhagavata because it speaks of the glory of Bhagavan or Vishnu. It is one of the most authoritative of Hindu scriptures. It is a work of great repute in India. It exercises a direct and powerful influence on the opinions and feelings of the people. It has acquired a wonderful hold on the minds of Hindus. It contains the essence of all the Puranas. In Bhagavata Purana alone the history of the universe is systematically dealt with. 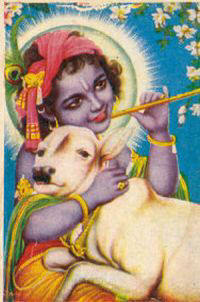 Lord Krishna is the central figure of this unique book. It is an authoritative book on devotion. Bhagavata teaches devotion that is associated with Jnana (Bhaktiytikta-Jnana). It does not divorce knowledge from Bhakti. It teaches that Jnana is extremely helpful to its perfect attainment. In Bhagavata the treacle of Bhakti is mixed with the elixir of Jnana. The Bhagavata Dharma as taught by the nine sages to King Nimi in the beginning of the eleventh Skandha, is thrilling and soul-stirring. The tenth Skandha contains all the Lilas of the Lord. 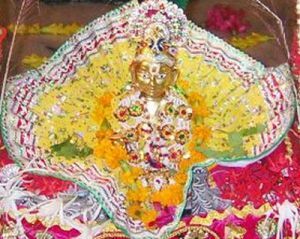 The youthful sports and pastimes, the funs and frolics of the divine child Sri Krishna, Kumara Lilas, Brindavan Lilas, Mathura Lilas, Dwaraka Lilas, Kurukshetra Lilas and Prabhasa Lilas are described in this Skandha. It contains 90 chapters. The tenth Skandha cannot be understood by those whose hearts are filled with passion and lustful tendencies. The aspect of lover and beloved found in every religion cannot be comprehended by people who are immersed in worldliness. The tenth Skandha contains the outpourings of the heart or the expressions of rapturous love of the human soul when it is freed from the impurities of the mind. When the impurities of the mind are removed, and the heart is thoroughly purified, the human soul is naturally drawn or attracted towards the Lord and is finally absorbed in Him. The Bhagavata prescribes various kinds of meditation to suit different types of aspirants. A beginner is asked to meditate on the Virat Purusha. He must think that the whole universe is the body of the Lord. This is given in the second Skandha. In the same Skandha and in the third also, meditation on the form of the Lord in the heart, and on His various limbs beginning from the feet, is described. In the eleventh Skandha meditation on the lotus of the heart with three layers, Agni as the first, Surya as the second, and Moon as the third, one over the other, is prescribed. In the same Skandha one is asked to meditate on the form of Lord Krishna first, and then to fix the mind on ether or the supreme cause, and finally to merge it in the Para-Brahman. Bhagavata Saptahas are held all throughout India. The whole Bhagavata is recited within seven days. This provides a good occasion for listening to and understanding the whole of Bhagavata. You should conduct Saptaha in your house once every year. This will contribute to your happiness and prosperity. Every one of you should have a copy of the Bhagavata in your house.